I don't have an iPhone but I am aware about how Siri works in this communication device. What is funny is that Filipino ingenuity came out as they introduced the Philippine counterpart of Siri, named Vangie, in a very comedic way. This is really hilarious and I can't stop laughing watching this video clip over and over. Kudos to those that conceptualize this. Filipinos are really very talented. Christmas holiday will soon be over but getting winter fashion during this holiday sale season is still rocking. 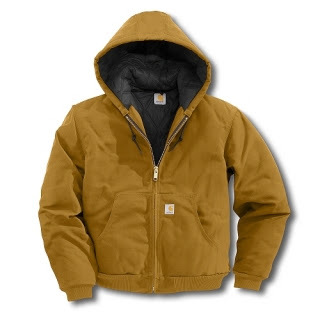 If you have plans of driving to places and requires your man a thick, comfortable jacket to sport on, check out carhartt jackets. It's very nice looking apparel, and I am pretty sure your man will be comfortable driving the family anywhere. I am thinking of getting one for the husband. He needs more thick jackets. He is very picky when it comes to what he wants to wear, but pretty sure he will approve of this jacket. It is not only comfortable but fashionable as well. On Wednesday, December 21, my husband decided to go to Redmond, WA where the Microsoft campus is located. He. wanted to work there, if he will be fortunate, after he retire from the Army. The campus is very big and it occupied both sides of a main street. We went inside the visitor center where you can find their store. You will also find there an interactive area showcasing Microsoft products, like Xbox, Kinect, Zune, different cellular phones, computers, music player, and more. All of it you can try using. The kids loved the Kinect and the Xbox gaming console. Hubby did tried the Kinect, playing tennis. It was really fun and if you want to lounge there and wait for someone, you could really do so. The distance from our place to the campus is about 63 miles. It took us more than an hour to get there. The traffic was kind of bad that time because we were on the road on a rush hour. It was my second time going there, but our first to really go in one of their buildings and checked out what's inside. It was a great experience and I still like to go there and check out there store for some great Microsoft products in the future. The fam really had a great time for our short trip to the tech campus. One of the things that is really important for us is to secure our kids future. There are many ways for you to do it, and I am sure that most parents are looking into it. We do not know or predict what can happen in the future so it is very important that we are ready in every ways. Right now we are all securing our property by getting insurance. Although are still scouting from different home insurance providers about premiums, but all the basic needs or insurance we are already covered. I discussed this with my cousin just yesterday while we were talking on the phone. They live in UK before for 9 years. They bought their house their and they also have also have home insurance and other riders in order to secure their property. It is really worth it because when something happened like flooding or fire, your property is covered. With us here, we have home insurance that I can really count on in case we need it. But we are still trying to look for other home insurance providers for earthquake insurance. We don't have it yet but we are looking for a good rate. I hope by next year we can find something affordable. We prefer to get it from our current provider, but they have high premium on it. We cannot afford right now if we add it to our existing account. Once I can get a job and able to help with our finances, then we will surely add the earthquake insurance. I am deeply saddened by what happened to the most affected cities of Iligan and Cagayan de Oro caused by the devastation of typhoon Sendong. Many lives perished and properties lost. The aftermath is just so heartbreaking to witness. I know the Filipino people are very resilient and can get back up after the tragedy. But the most important thing this time is to help those that are affected. The survivors need basic necessities so if you all have something to give and help there are many organizations, government and private, that you can channel your help with. I hope that the government of both cities will be able make plans for the relocation of those that are affected and we can only hope and pray that this tragedy will not happen again. 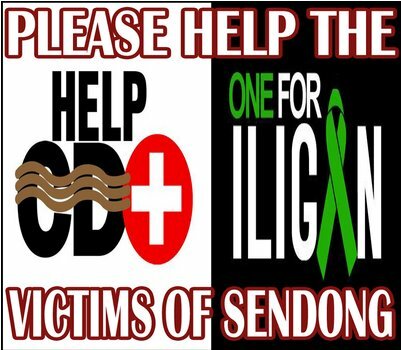 One website to check out and send donation is www.oneforiligan.com and a friend of mine also doing her best to help. Check her blog here Mixed e-catch and any donation you can share is greatly appreciated. The southern island of the Philippines, mindanao, was hit by the recently devastating typhoon Sendong. It hit 2 of the cities in mindanao, specifically Cagayan de Oro City and Iligan City. These 2 cities are really dear to me since I have families and friends that live there. Thank God my brother's family was not affected. I am saddened by those that not only lost their belongings but also lost their loved ones. 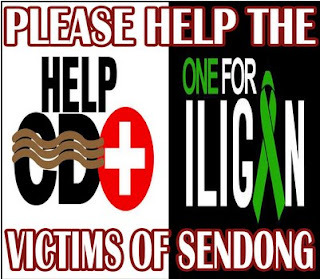 It is really heartbreaking looking at the news and pictures of what Sendong had caused. For the past 2 days I was very worried because I can't contact my sister-in-law. My brother is not home because he works overseas. He will be back home next year. They were once a victim of flooding that is why I am very concerned. I called them up this morning and was very glad they are okay. I will encourage my brother to just stay on land and venture for a new business when he gets home. It is hard to think that at times like this he is not around to be help his family. I know he was already thinking of a welding shop before and, in fact, already have welding cable and other machinery to start with. He also need to move out of their current place and live at an elevated area. He told me they already bought a lot in one of the elevated subdivision in the city. The only thing they need is enough money to build the house. I am hopeful that when he gets home they will pursue to move out so we will not be worried for them anymore when such calamity happens again. To all the people affected with the typhoon, I pray that you will continue to be strong and hopeful despite everything. I know the Filipino people are very resilient and can still find good amidst the catastrophe. I also pray that people in the Philippines will go hand in hand together to help the victims. Every Sunday we make sure we can go to church and so far we are doing it. We will continue to do so for the years to come. I am glad that me and my husband are both into to it, to show our kids how grateful we are to God for all the blessings that we receive each and everyday. While at church, I can see many people are incorporating using electronics while at service. Some use their ipod, ipad, kindle or any e-reader, and even smart cellphones to read the bible. I think even at the church service it is more interactive now at this hi-tech time. Our pastor is also very encouraging about it. The service that we have every Sunday also have a live streaming on the internet. If church member is out of town and still want to hear or see the service, he/she can go online and watch it. So high tech, isn't it? I think for those conservatives that are not agreeable to the idea will just have to accept that people now have so much choice on most things. Using high tech gadgets is not only for socializing or business but even in the way of expressing your faith. I am still on the moderate side. I myself brought my kindle where I downloaded the Bible, but we still brought the real one to church and prefer it more than the electronic one. According to surveys of the most in demand gadgets nowadays are the ipads, other tablets, ipods, e-book readers, and other electronics that are not only on trend with adults but kids as well. In our house we only have one Apple product and that is an ipod touch that I gave to my husband on his birthday. I am planning to have another laptop and thinking of a MacBook pro. But this plan is not anytime soon. I still have to save money for it. But for those who are planning to buy electronics from the Apple store, check out this Apple Store promotion code and start saving now. When I bought some stuff online for gifts to my loved ones I checked out different coupon codes for different store so I can save money. Geek alerts is one site that I like to get coupon codes for gadgets. They have wide range of store coupons for different electronics. If you are thinking of getting something from best buy, they also have coupon codes to grab as well as other stores. Geek alerts really alerts you for deals to score in electronics and other gadgets. So why not check the site now and start using coupon codes to score a deal with your gifts fo your loved ones. I am just driving for six years. This means I am a newbie compared to those who are born and raised here in the US where they have the opportunity to drive, if they want to. At the age of 15 you can have your student permit. When I learned how to drive and have my permit, my husband added me as a driver to our auto insurance. When he got me my first vehicle, we also made sure that it has insurance with full coverage. We cannot emphasize enough how important to have an auto insurance especially when we are driving. We do not know what can happen on the road. We may be the most defensive and careful driver, but the danger of driving on the road with different motorists is high. We do not know when accidents happen. This is why is best to have the security and be prepared of what might happen, God forbid. Some people say they cannot afford the cost of insurance and they will just have to be careful while driving. It is not always the case. When somebody hit you or collide with you on the road, you will just have to run because you don't have insurance? The best thing is to have one. Find a Cheap Car Insurance. I know there are lots of low premiums auto insurance that you can find. The internet is a great resource to research for one. Some services will enable you to get a free quote and free comparison with other providers so you can save more money. Our car insurance bill came out last month and I am so happy that we got a Cheap Car Insurance. Our premium went down. We saved around $27 from our previous one. According to our provider, since we have clean driving record they lowered our monthly premium. That is just awesome. This motivates me more to drive safely and carefully. The US unemployment rate as reported for the month of November went down to 8.6%. It is only for the last month's activity so it is not yet perceived as the monthly trend since we don't know what will be the situation this month and the coming months. More people were hired because of the holidays. Most retail industries and businesses are hiring employees as holiday help until January. There are others that are also retained after the holidays depending on a company's need. I am glad to see this news and at last we can say there is still hope. I am hoping that people will continue to have their jobs right now and those that don't have can find one soon. I know how it feels to have no job at all. I am wishing that in time I can also get a permanent job, so I can help my family. I thought of having my own business. I have heard that merchant cash advance can help in financing your business. But I need to wait to finish my program and see if what I am planning will be viable. For now, I will concentrate on it and finish as soon as January or February. I believe it is but normal that during winter electricity bill rises up. This is because we use too much of the heater to keep us warm in the cold winter weather. As a first time homeowner, we were anticipating higher bill this season than when we were still in the apartment. True enough, around end of October we started turning on our heater. My husband put it in auto mode. When the inside temperature goes down below 70, heater will automatically turn. Now that it is already December, the temperature drops low especially in the evening time. Our bill during summer was around $70s, now it went up to 60%. How I wish there is another way to lower our bill or use a low cost energy like those of the pennsylvania electricity. Unfortunately we only have one electricity company here that service our community. I am not sure though if there are other choices. Good thing though, as our electric bill go up, our water bill seemed going down in the process. One thing that causes this is not watering the yard anymore because we have abundant water supply, literally through rain. Last month I am not sure how much will be our energy consumption since we did not receive the bill yet. I hope it will not cost us an arm and a leg. I told my husband that we will just wear thick, fleece house clothes when we are home, so we will not turn our heater high. But we have kids and I don't want them to get cold while in the house. This is one reality being a homeowner, the cost of utilities is really different.